Yes, you know that its true - really smart people play chess. More than any other game, chess requires raw intelligence to analyse situations and plot moves in several directions while anticipating the attacks of his opponent. A good player has the capability to do all this and then decisively execute his strategy with elegant and ruthless tactics. I agree with all of that, except the first part - you don’t need to be intelligent to play chess well. In my opinion, you need to be a good chess player to play chess well. But what exactly do I mean by intelligence? I mean the capacity to learn new skills and concepts quickly, the ability to look at a situation and interpret in new and interesting ways, to come up with creative solutions to problems that most would prefer to solve a conventional way. Someone who possesses these skills would be well equipped to excel in a variety of fields, though not all or even most fields. Someone who has these skills would no doubt grasp the essentials of the game quickly and with a little time and effort, would begin to play the game with a fair degree of proficiency. This is why it is so common to see erudite characters in TV shows and movies often enjoy a game of Chess. Bonus points are granted if the character plays both sides by himself. The President in the TV show The West Wing is a classic example of this - a Nobel Prize winner in Economics, knowledgeable about theology, capable of speaking 4 languages and so on. Now and then you’ll see him playing multiple games of chess at the same time, while lecturing his opponents about geopolitics. It gives his words a ring of correctness when he’s crushing the person who’s disagreeing with him. Another example I can think of is Professor Xavier (Patrick Stewart) and Magneto (Ian McKellan) playing a game at the end of X-Men. In classic fashion, they’re having a discussion about the right approach to take while dealing with non-mutants and the winner of the argument (Prof X) deals a mortal blow to Magneto’s pieces while simultaneously delivering the closing line of the movie. 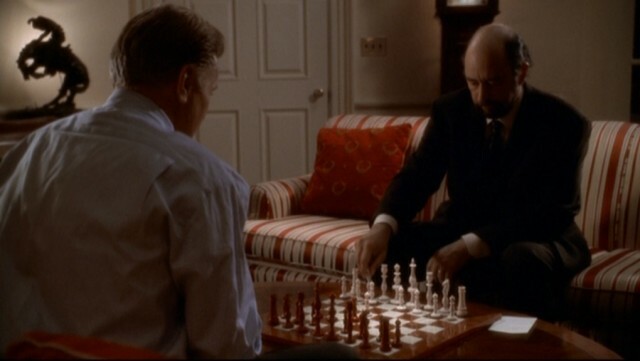 Years after watching it, I learnt that neither of them had any idea how to play Chess. Quite unexpected for 2 actors who are really intelligent otherwise. Other characters who are super smart and therefore like chess are Professor Moriarty and Sherlock Holmes. As expected, by the end of the movie these two intellectual giants are locked in a battle of wills for which the blitz chess game is a metaphor. Of course, if you’re really intelligent, then you won’t waste your time with ordinary 2-D chess. 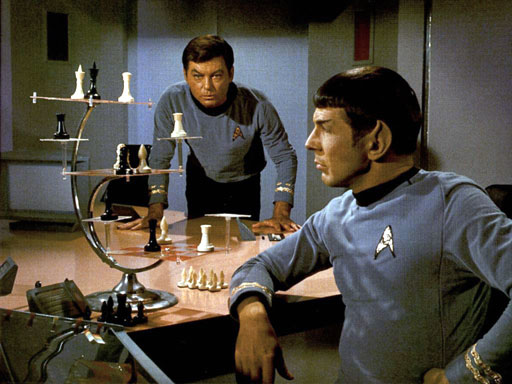 Here, Spock (Leonard Nimoy) and Captain Kirk(William Shatner) from Star Trek take it to the next level with 3-D chess. Being huge fans of Spock and Star Trek, its not surprising that the geniuses The Big Bang Theory also play 3-D chess. In fact, the only character I can think of off-hand who was good at chess but little else was Ron Weasley from the Harry Potter series of books. Let’s face it though, if Hermione got this ability in addition to book smarts, he’d have been pretty useless to Harry’s efforts at defeating Voldemort in the first book. I think the general trend of portraying intelligent characters as chess players plays into the popular perception that a good player is smart and also reinforces that notion in our minds. This is the reason that parents think its alright for their kid to spend a lot of time playing chess, but its not OK to say, “waste” their time on video games. I think that’s a little funny, especially considering how different chess is from other desirable pursuits like sports(that involve running around) and music and how similar it is to a game like StarCraft. Both chess and StarCraft are 1v1 games with a few differences. Chess is turn-based, and SC is real time, meaning that both players can move at the same time. This means that chess almost solely involves strategy whereas SC has requires a player to master both strategy and tactics. Both sides have identical armies in Chess while players have to build their armies in SC based on what the opponent is building. However in both games the control of the battlefield is key, with players sometimes sacrificing units in exchange for area. I suppose I really get the feeling that they’re two of a kind when I see players try to get into the mind of the opponent and try to anticipate what he might be doing 1, 2 or 5 moves/minutes in the future. I wonder if more people knew how this game worked we would see more of it in movies and TV shows. I, for one, would welcome a battle of wills and wits being fought over a virtual map rather than the now cliched chess board. Don’t get me wrong though, I have nothing against chess players, or against the game. I used to play the game myself, though I no longer do. I just find its portrayal in pop culture a little irksome because of the way it warps people’s perceptions about intelligence. As far as intelligence itself goes, I think the only thing that really matters is the willingness and desire to learn - anything is achievable with this.